How can scrum be made scalable? Scalability of a process, network, or unit is its ability to adjust or adapt to any expansion. For example a central server is said to be scalable if it performs similarly when attending on either five clients or fifty clients. In Scrum, it means that the scaling mechanisms applicable for a single Scrum Team can also be used for larger projects with multiple teams. How to scale? Scalability in Scrum is achieved primarily through the Scrum of Scrum (SoS) Meetings. Scrum recommends small teams; however if teams are larger it is recommended that they are divided into smaller teams who can meet occasionally to discuss their status. What makes Scrum scalable? It is recommended that Scrum Teams should ideally have six to ten members. This does not mean that Scrum can be used only in small projects – it can be scaled to be used effectively in larger projects. If the size of the Scrum Team exceeds ten members, then multiple teams can be formed to work on the project simultaneously. Scrum of Scrums facilitates synchronization between multiple Scrum Teams in larger projects. Team representatives update each other about team’s progress, challenges faced and coordination activities. Frequency of Scrum of Scrums (SoS) Meetings is determined by inter-team dependency, size of the project, recommendations by Scrum Guidance Body (SGB) and complexity level. Scaling in Distributed Teams: Scrum recommends colocated teams and face-to-face communication between team members. This is often not possible, as companies have distributed teams working in parallel across geographies and time zones. For the purpose of scaling, in larger projects employing distributed teams, the Scrum of Scrum Meeting can be held using video conferencing, chats, social media etc. The Scrum of Scrums meeting is usually held at predetermined intervals or when required, to collaborate and track progress, address impediments and dependencies across projects. An agenda for the meeting can be announced in advance by the Chief Scrum Master, allowing individual teams to consider the items for discussion. Impediments faced by individual teams, likely to affect other teams should also be indicated. Issues, risks and changes likely to affect multiple teams should also be communicated during this meeting. Achieving Scalability: Each team representative is expected to update other teams, usually in the form of four questions. (i) What has my team been working on since the last meeting?, (ii) What will my team do until the next meeting?, (iii) What were other teams counting on our team to finish that remains undone?, (iv) What is our team planning on doing that might affect other teams? Result of Scrum of Scrums Meetings include Better Team Coordination facilitated coordination of work across multiple Scrum Teams, especially when there are tasks involving inter-team dependencies (as future tasks of one team may depend on the timely delivery of a task by another team). Discrepancies between work and deliverables are quickly exposed. The Scrum of Scrums is a forum where team members can transparently discuss issues and resolve them. Scrum of Scrum of Scrums: In organizations that have several Scrum projects happening simultaneously, the Scrum of Scrums Meeting can be scaled up another level to a Scrum of Scrum of Scrums meeting. In this situation, a separate Scrum of Scrums Meeting is held to coordinate each group of projects that are directly related to each other. 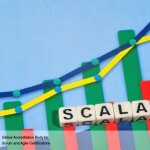 One Response to How can scrum be made scalable?